The People’s Movement Against the Port City has criticized Prime Minister Ranil Wickremesinghe for his change in policy against the controversial port city project funded by China, while also warning the mega project might become the centre for money laundering and illegal commercial activities. 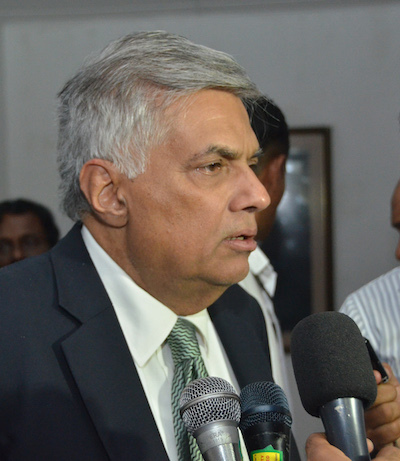 “It is very unfortunate that Mr. Wickremasinghe, now as the Prime Minister of the Government of ‘Good Governance’, is not only acting against his own words but also against the promise that he made to millions of people who voted him to power trusting his pledge,” the movement said in a statement. The movement also alleged that although the project is planned as an offshore financial market, so far there are no regulations in place to control its commercial enterprises. “There is a danger that it might become a center for money laundering and illegal commercial activities, the statement said. Following Wickeremesinghe’s statement at a media conference on the 10th April 2016 where he announced that the the port city project will continue, along with a decision taken by Sri Lanka to provide 1000 acres of land in Hambantota and Mattala to locate Chinese industries, the movement accused the government for violating the very basic principle on which it stands. “Can the Prime Minister make decisions on this matter ignoring the two pending cases in the Court? One might wonder where is the rule of Law?,” the statement questioned. According to the organization, moving ahead with the project without taking into account the concerns of the people affected, the fishing community, the people who responded adequately to the EIA report and the concerns of the civil society which has not only highlighted their grave concerns but vehemently opposed the project due to its adverse effect on our ecosystem is a violation of their basic right for participation in good governance and decision making. “We wish to ask where is the space for People’s Participation, which is a hallmark of democracy and good governance?,” the statement said. “It has to be stated that this type of senseless development is tantamount to transferring the wealth and the physical resources such as sand, rock materials, land, Colombo harbor, Mattala Airport and Hambantota harbor of the country to China making Sri Lanka poorer,” the movement said. “Can mere mortgaging this land to China or any other big power be called development, Fr. Sarath Iddamalgoda the joint coordinator of the People’s Movement Against Port City asked. Fr. Iddamalgoda also raised the question as to whether the Prime minister has assured the integrity and safety of our natural resources and the rights of the people with regard to the environment. “Prime Minister has no reason to celebrate USD 1.5 billion Chinese project when the project is going to dump sand and rock material worth over USD 4 billion to fill the ocean with no equity equivalent ” said Mr. Hemantha Withanage. “Port City is not a standalone project of China. Therefore, this is feasible for China, however there is no study to prove that it is feasible for Sri Lanka” said Chinthaka Rajapakshe, Joint Coordinator of the People’s Movement Against Port City. According to the statement, it is a well-known fact that China is looking for Sri Lanka as a strategic point in its ‘One Road One Belt’ strategy and also for relocating its polluting industries to manage severe environmental pollution China is facing at the moment. “It is an obligation to fulfill the climate agreements they made during the climate conference held in Paris in December 2015,” the movement claimed. “Colombo Port city the Chinese dream is not part of the Megapolis, which is the dream of the ruling regime. The government should stop lying to the people of Sri Lanka promising brighter future though this unsustainable development businesses,” the statement added. Middle East and Far East and Sri Lankan airlines could profit by operating on these profitable routes as travellers, specially pilgrims from NCP & N/E, will not want to trek to BIA all the way in the hot sun to take a flight,say to Chennai, which takes only 30 – 40 minutes, as flight time and the hassles they undergo, so with the exporters of perishable cargo, which could perish before reaching BIA. More over, the air fares and airfreight charges will be much cheaper than the current prices due shorter air distance to be covered. for airport extensions happened at Ratmalana airport, Katunayake airport and even at Heathrow airports, where people’s voice is much stronger. It is shocking that the administrators of N/E, who are educated too, do not think of long term benefits for the provinces but confine themselves only to language, religion and secluded living. You are 100% correct. Please tell me what is there for NPC govener to loose. He is retired and he wants to keep him self busey for his retirement life. He is living a luxury life. He wants problem for him to survive. The Jaffna airport would have been a major push for the ecconomy. Except north all the other ares you can developement.